The story is told about how Henry Bourne Joy camped at this location on one of his many cross-country trips along the Lincoln Highway; he is said to have witnessed the most beautiful sunset of his life here. It was so beautiful that he said he wanted to buried here when he passed on. His family decided to bury him in the family plot in Detroit in 1936, and instead provided and placed a monument at this location. 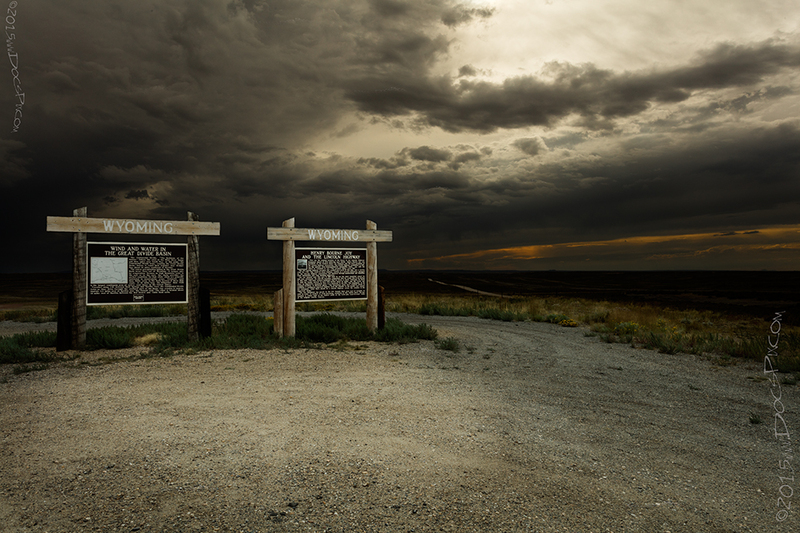 In 2001, it was moved to the Summit rest area at the base of the Lincoln Monument east of Laramie because of vandalism. The state placed the billboard on the right to mark the location. The original location of the Henry Bourne Joy monument in Sweetwater County. The Henry B. Joy Memorial, c. 1986. Wyoming State Historic Preservation Office, Wyoming State Archives, Department of State Parks and Cultural Resources. Payson W. Spaulding was the first and only state consul for Wyoming; he advised Henry B. Joy about the path that the Lincoln Highway would take. 1915 LHA: New York: 2202 miles; San Francisco: 1182 miles Population 125, Altitude 6,702 feet. Sweetwater County. One hotel: Wamsutter Hotel, Eu. One garage: storage, night, 50c. Gas 30c. Oil 75c. Route marked through town and county. Extensive road improvement planned for 1915. Good detour road without mileage increase over L.H. One R.R., 1 Exp. Co., 1 Tel. Co. Camp site. Red Desert wasn’t included in the original LHA guidebook, but some of the historical documentation indicates that this was a stop for travelers along every alignment of the Lincoln Highway. Like most of the towns along this route, Red Desert was a railway station complete with section house and telegraph. Red Desert Gas Station, c.1987, Wyoming State Historic Preservation Office, Wyoming State Archives, Department of State Parks and Cultural Resources. Table Rock, similar to Red Desert wasn’t included in the original LHA guidebook, there was a section house and telegraph located near the highway. Table Rock was the site of a flourishing company town starting in the late 1970’s, but shortly after the turn of the century, it began to disappear. 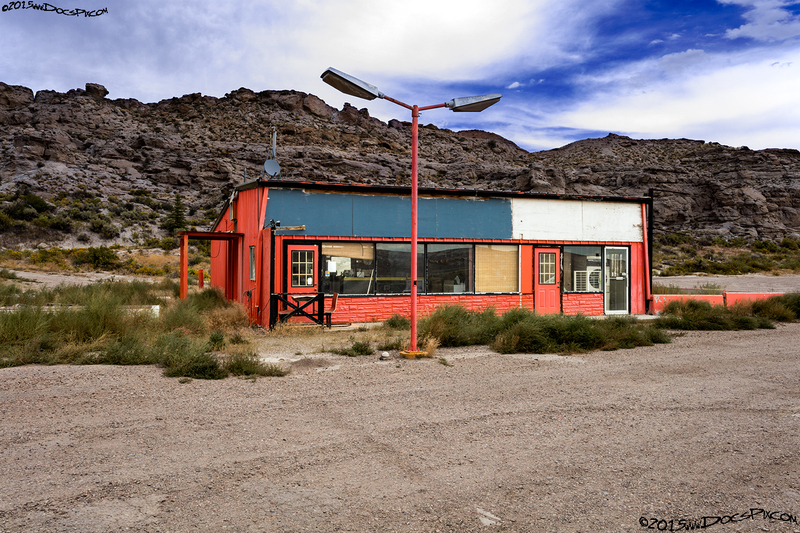 All that remains today is the dilapidated remnants of a gas station, and trailer-home. A tin oilman greeted travelers and locals at the Table Rock gas station. 1915 LHA: New York: 2237 miles, San Francisco: 1147 miles Population 50, Altitude 6,512 feet. Sweetwater County. One hotel; Rador Hotel, $1.50, Amer. Gas, 30c One R.R., 1 Exp Co., 1 Tel Co. Camp site. The Point of Rocks Stage Station, c.1982. Wyoming State Historic Preservation Office, Wyoming State Archives, Department of State Parks and Cultural Resources. The former Point Bar & Laundry maintains a lonely vigil at the center of town. 1915 LHA: From GREEN RIVER to LYMAN the roads vary from well graveled to clay. This service station has been a Lincoln Highway staple since 1950. 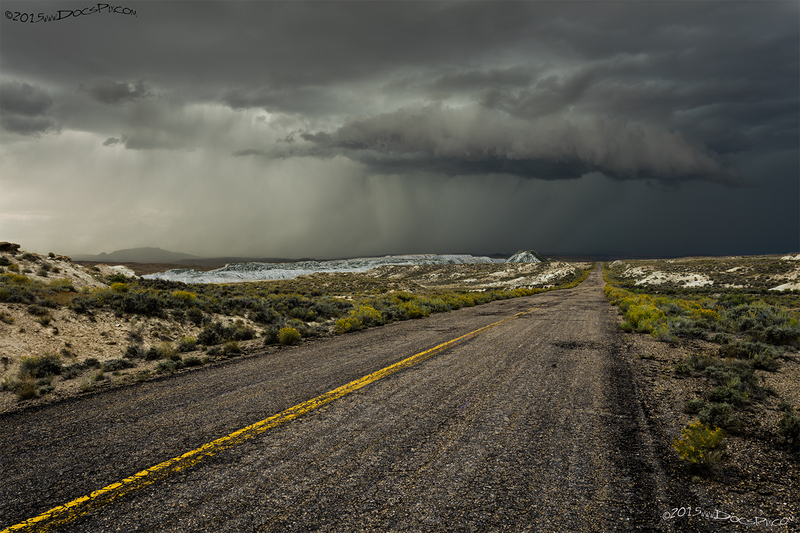 Located about 5 miles west of Green River, it has steadily deteriorated by time and vandalism since the 1970’s. 1915 LHA: New York: 2313 miles, San Francisco: 1071 miles Population 100. Altitude 6,284 feet. Sweetwater County. Two hotels, accommodations for 50. College Inn; Bagley. Gas, 25c. Route marker through town and county. Two R.R’s, 2 general business places, 1 Exp. Co., 1 Tel. Co., 1 public school. Camp site. The Road leading north and west, open to tourists, via Pocatello, is reported to be the most desirable route for motorists contemplating a visit to Yellowstone National Park. First-hand information as to this route indicates that the road via Pocatello leads directly to an official entrance at which will be found all tourist conveniences. It is also said that from this point the road to Glacier, Montana is the best. It is suggested that tourists contemplating a trip to Glacier National Park communicate with the President of the Commercial Club of Darby, Montana, who will furnish maps and other information of value. Granger Station, c. 1982. Wyoming State Historic Preservation Office, Wyoming State Archives, Department of State Parks and Cultural Resources. 2: Book: Wyoming Place Names, Pg. 46, 2004 Ed. Mae Urbanek, Mountain Press Publishing Company, Missoula, MT. 3: Box 96, Folder Number 5, Payson W. Spaulding papers, 1886-1980, Collection Number 01803, American Heritage Center, University of Wyoming. 4: Box 96, Folder Number 6, Payson W. Spaulding papers, 1886-1980, Collection Number 01803, American Heritage Center, University of Wyoming. 5: Book: Wyoming Place Names, Pg. 120, 2004 Ed. Mae Urbanek, Mountain Press Publishing Company, Missoula, MT. 6: Book: Wyoming Place Names, Pg. 216, 2004 Ed. Mae Urbanek, Mountain Press Publishing Company, Missoula, MT. 7: Book: Wyoming Place Names, Pg. 165, 2004 Ed. Mae Urbanek, Mountain Press Publishing Company, Missoula, MT. 8: Book: Wyoming Place Names, Pg. 200, 2004 Ed. Mae Urbanek, Mountain Press Publishing Company, Missoula, MT. 9: Book: Wyoming Place Names, Pg. 158, 2004 Ed. Mae Urbanek, Mountain Press Publishing Company, Missoula, MT. 10: Book: Wyoming Place Names, Pg. 204, 2004 Ed. Mae Urbanek, Mountain Press Publishing Company, Missoula, MT. 11: Book: Wyoming Place Names, Pg. 26, 2004 Ed. Mae Urbanek, Mountain Press Publishing Company, Missoula, MT. 12: Book: Wyoming Place Names, Pg. 85, 2004 Ed. Mae Urbanek, Mountain Press Publishing Company, Missoula, MT.